All changes logs more than two years old are removed. Children visitors that have not check-in and who now exceed your visitor retention settings are removed from the Visitors section. Email errors more than 6 months old are removed. All Logins logs more than two years old are removed. All deletion logs more than two years old are removed - the "Deleted" reports referred to in this article will only show deletions in the last two years. Beyond these housekeeping tasks that remove data from your account, your users will also delete data too. This article explains how you can easily produce reports of deleted data in each of the modules in your account. Ordinarily you might choose to archive contacts in your Address Book when people are no longer part of the church; allowing them to be re-instated if necessary. Archived contacts can be viewed in the Contacts section of the Address Book - simply change the View from Active to Archived. However, if you delete contacts, there is a Deleted Contacts report available to show you who has been deleted, when, and the User that deleted them. There are further reports for deleted Flows, Key Dates and Tags. In "Address Book" > "Reports" section, scroll down to the Deleted section and open the Contacts report. Please note that it is not possible to reinstate deleted contacts. Ordinarily you might choose to archive children in your Children module when families are no longer part of the church; allowing them to be re-instated if necessary. Archived children can be viewed in the Children section of the Children module - simply change the View from Active to Archived. However, if you delete children, there is a Deleted Children report available to show you who has been deleted, when, and the User that deleted them. There are further reports for deleted Groups, Key Dates and Tags. In "Children" > "Reports" section, scroll down to the Deleted section and open the Children report. Please note that it is not possible to reinstate deleted children. If an event you are looking for cannot be found in your Events list, it may have been deleted! There is a report available to show you what has been deleted, when, and the User that did the deletion. There are further reports for deleted Categories, Leave Requests and Leave Setup. In "Calendar" > "Reports" section, scroll down to the Deleted section and open the Events report. Please note that it is not possible to reinstate deleted events. Note that the report filters the date(s) of deletion, not the date of the events! Rather than deleting a ministry, you may prefer to archive it - meaning that it can be reinstated in the future if necessary. Reports are provided for deleted Ministries, Roles and Rotas - showing you what has been deleted, when, and the User that made the deletion. In "Rotas" > "Reports" section, scroll down to the Deleted section and open the appropriate report. Please note that it is not possible to reinstate deleted ministries, roles or rotas. Ordinarily your Active small groups become Past groups when the group's end date passes. If you're looking for a group and can't find it in your Groups list (past, active or future), it may have been deleted! Reports are provided for deleted Clusters, Groups, Roles and [Group] Tags - showing you what has been deleted, when, and the User that made the deletion. In "Small Groups" > "Reports" section, scroll down to the Deleted section and open the appropriate report. Please note that it is not possible to reinstate deleted small groups. Ordinarily you might choose to archive givers in your Giving module when people are no longer giving to the church; allowing them to be re-instated if necessary. Archived givers can be viewed in the Givers section of the Giving module - simply change the View from Active to Archived. 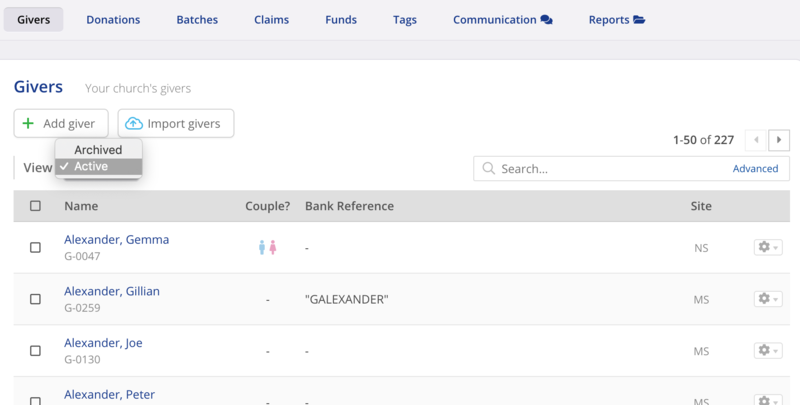 However, if you delete givers, there is a Deleted Givers report available to show you who has been deleted, when, and the User that deleted them. There are further reports for deleted Claims, Declarations, Donations, Funds and Pledges. In "Giving" > "Reports" section, scroll down to the Deleted section and open the Givers report. Please note that it is not possible to reinstate deleted givers. Givers with active pledge subscriptions and those with donations included within a Gift Aid claim (UK only) cannot be deleted. Rather than deleting a booking, you might instead change a booking's status from active or pending to cancelled. If you're looking for a booking and can't find it in your Bookings list (cancelled, pending or active), it may have been deleted! However, if you delete a booking, there is a Deleted Bookings report available to show you what has been deleted, when, and the User that deleted them. There are further reports for deleted Charges, Customers, Resources and Types. In "Bookings" > "Reports" section, scroll down to the Deleted section and open the appropriate report. Please note that it is not possible to reinstate deleted bookings. Note that the report filters the date(s) of deletion, not the date of the bookings! Rather than deleting a user, you might instead prefer to change a user's status from active or inactive. If you're looking for a user's account and can't find it in your Users list (active or inactive), they may have been deleted! However, if you delete a user, there is a Deleted Users report available to show you who has been deleted, when, and the Administrator that deleted them. In "Administrator" > "Reports" section, scroll down to the Deleted section and open the Users report. Please note that it is not possible to reinstate a deleted user. What happens when I archive a contact?